From 4pm Saturday April 13, 2019 through 2pm Saturday April 20, 2019. Attending this sesshin part-time is acceptable with early departures planned for 4:00 pm Monday or Tuesday. Contact the sesshin registrar (see form below) to negotiate details of part-time attendance. All participants should arrive at Mt. Lamp Practice Center on Saturday by 4pm. An informal meal will be offered at 5pm with orientation beginning at 6:30pm. Sesshin will conclude with an informal meal around noon on the following Saturday, followed by clean-up. Participants are expected to help with clean-up and shouldn’t plan to leave until 2pm. Mountain Lamp Practice Center near Deming, WA (directions provided on request). The Center has indoor accommodations for 21 with plenty of choice tenting sites. Participants who are able are encouraged to bring tents and camp. Indoor accommodations are assigned on a first-come/ first-served basis. Alert the registrar if you have medical or other reasons requiring private space. Phone for emergency only: 360-592-0600. Be advised that no cell phone coverage is available. Payment is due in full upon registration to reserve space. This will be refunded in full if cancellation is received three weeks prior to start. Within three weeks, a $50 cancellation fee applies. If you register and begin to have doubts or second thoughts, please arrange to speak with Jack before cancelling. Payment plans and scholarships may be arranged with the registrar (see below). All payments must be in US currency. Regular and Supporting TTS Members, full time: $460 (dues must be current to qualify for this rate). If you are able, please add a donation for scholarships. Thanks! All meals are included in the sesshin fee. Meals are vegetarian including milk, eggs, and cheese. If you have a medically prescribed diet or needs, please advise the registrar below. Zafus and zabutons are provided, though you may bring your own support cushions and bench. Bring clothes for sitting (unpatterned, dark) and for work (inside and out; including footwear); sleeping bag (tent, if camping) or bedding with pillow; towel and personal toiletries (soap, shampoo, toothpaste, etc.). Optional: raincoat, umbrella, insect repellant, alarm clock, earplugs (for light sleepers), flashlight. Cell phones & other electronic devices aren’t necessary, and there is neither wi-fi nor cellular connection available. Dana for the teacher supports Jack personally. Dana for Three Treasures Sangha allows us to pay Jack a salary, provide sesshin scholarships and maintain our Seattle facility. If you donate, please indicate the recipient of your donation, and accept our thanks. 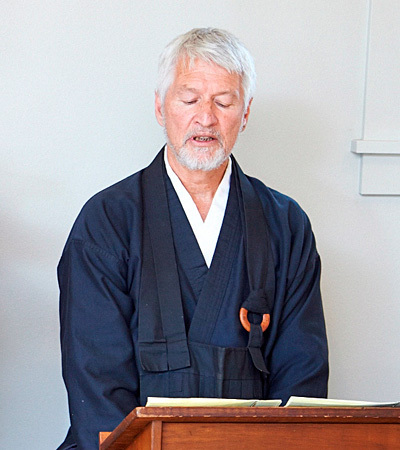 Register online or print and mail this form with your check in USD for full sesshin fee (payable to Three Treasures Sangha) by March 23, 2019 to Jan Mikus, 1614 26th Circle, Anacortes, WA 98221 (janmikus@comcast.net/206-524-0806). Paypal payment options will be presented after submitting the form. I volunteer to be a food shopper. I can give a ride. Click Submit to pay with PayPal. If you are able, please add a donation. Thanks! Donations can be made as a separate transaction by clicking “Donate” in footer.